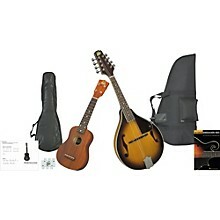 A mando and a uke in one affordable package. This mandolin and ukulele travel pack includes a RM-100A A-style mandolin, a mandolin gig bag, a soprano ukulele starter pack (including a ukulele, gig bag, pitch pipe, chord guide, and tuning instructions), and a Mandolin Chord Finder book. Sporting a gorgeous finish, the Rogue RM-100A is a well-built, traditional A-model mandolin. It features clean workmanship throughout and projects a bright tone with lots of bark. With an easy-to-play neck and adjustable bridge, the RM-100A is perfect for beginners who wish to play bluegrass or any other style of music. Finishing touches include chrome tuners and nickel-plated frets. This kit is the real deal, not a toy. The neck is nicely shaped and finished in a satin lacquer to give it a great feel. It features a mahogany body, champion-style friction pegs, mahogany bridge, inlaid position markers, and Martin strings. Black 600-denier Cordura exterior, ample high-density padding (18mm). Has a large accessory pocket and shoulder strap. Designed to hold A- and F-model mandolins. Learn to play chords on the mandolin with this comprehensive, yet easy-to-use book. The Hal Leonard Mandolin Chord Finder contains over 1,000 chord diagrams for the most important 28 chord types, including 3 voicings for each chord. Also includes a lesson on chord construction, and a fingerboard chart of the mandolin neck.